Children are among the most vulnerable during and after an emergency. When Typhoon Haiyan hit the Philippines on November 8, 2013, countless children living in remote communities were left cut off from critical health care services. International Medical Corps First Responders were on the ground within 24 hours and began health consultations in the most remote and hardest-to-reach areas. Leyte province was one of these isolated yet devastated areas where International Medical Corps First Responders set up operations. Linked with the massive destruction of crops, cut-off supply routes and the risk of communicable diseases, our teams found that many children were at risk of malnutrition and needed immediate health interventions. 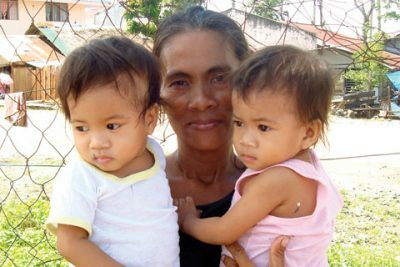 A resident of Albuera in Leyte Province, 36-year-old Melodina is the mother of 9 children, ranging in age from 20 years to 20 months. Her 20-month-old twins, Cristina Marie and Cristine Joy, are now receiving a regular supply of a peanut-based paste called PlumpySup, a nutrient-rich food supplement provided by International Medical Corps, UNICEF, and the World Food Program (WFP). Prior to the typhoon, Melodina’s children subsisted off of their father’s construction wages of 200 pesos (4 USD) per month, which paid for rice and fish. The root crops and vegetables grown in their backyard supplemented the family’s diet and income. Because Typhoon Haiyan destroyed the family home and garden, they are no longer able to rely on their crops for money or for food. Furthermore, the children’s father is left without a regular means of income. Now, the family lives in a makeshift tent and relies on relief goods and help from non-governmental organizations. Melodina has been coming to the barangay (neighborhood) distribution site for Cristina Marie and Cristine Joy’s lifesaving food rations. Working with UNICEF and the World Food Program, International Medical Corps is able to reach Albuera with critical nutrition programs — as well as ten other municipalities affected by Haiyan. These programs are designed to manage and treat acute malnutrition and especially promote infant and young child feeding. Cristina Marie and Christine Joy are just two examples of vulnerable children at risk of acute malnutrition after a natural disaster. Melodina is very thankful for International Medical Corps and our support of her family during these difficult times.